You are here: Home / Moving to Spain. Really? The HONEST Truth from Real People (Expats) Living in Spain.. / Why Does Moving To Spain Go Wrong – What Are The Problems and Pitfalls? Why Does Moving To Spain Go Wrong – What Are The Problems and Pitfalls? Moving to Spain and relocating to Spain is a major life-changing decision and event, so why is it that many people who relocate and move to Spain very quickly end up moving back to their home country? Within three years 30% of Brits have already moved back. In the article below we examine why moving to Spain goes wrong for the majority of people and in doing so we help you decide if moving to Spain on a permanent basis is really right for you and your family. Knowledge is power and knowing why people fail to settle successfully in Spain could make your transition easier. Spain – Heaven or Hell? Why Does Relocation To Spain Go Wrong? Within a short time a surprising number of people return to their home countries having relocated to Spain. Some figures, for example, seem to suggest that 30% of Britons go back to the UK after only three years in Spain and it is possible that percentage continues to rise over the following years. On the face of it, this is surprising – given that to relocate to Spain will almost certainly have represented a long term dream. So, what goes wrong and how can you ensure that your move to Spain will work? 1. It is the experience of many estate agents that the impulsion to move back to a home country comes from the female in a relationship. Often, she was reluctant to leave her family and friends permanently in the first place and finds it hardest to tolerate any absence. With the arrival of grandchildren, her desire to be close to them becomes hard to resist and will initiate the return. 2. A lack of genuine consensus about relocating between couples. 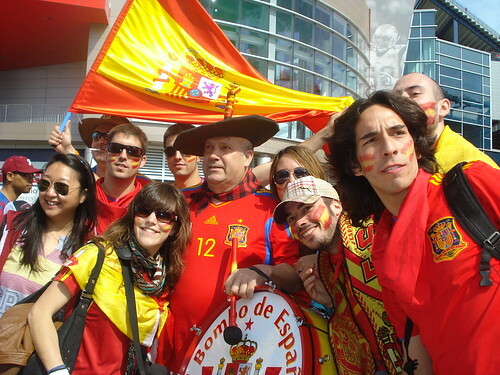 Often, there is no real consensus betwen a couple about relocation to Spain. In many cases, it is the man that is most keen – with his partner effectively acquiesing in the move. As soon as there are any problems, then recriminations are quick to occur with the one desiring the move being placed continually on the defensive. This can produce real friction within a relationship. 3. Spain is not a paradise – nor is it some kind of elixir that will resolve existing problems, particularly if they concern an already damaged or unsteady relationship. Spain provides a different way of life and one that can provide terrific enrichment and fulfilment within a friendly environment whilst enjoying a wonderful climate. However, rarely will it make you wealthier or change structural faults within a partnership or marriage and it is a mistake to expect living in Spain to resolve all your problems. Indeed, the stress of moving and adjusting to a different way of life can hasten the termination of a relationship. 4. Spain is certainly cheaper, on the whole, than many parts of Northern Europe. But it bears no resemblance to what it was fifteen or twenty years ago. Good, legal properties on the coast are expensive and you still need a reasonable income, if you are to sustain your new life live comfortably and without financial worries. On the whole, living in Spain is reasonably cheap and you should find that you spend greatly less, day to day, to gain much more than you could have had done in Northern Europe. But, if you have tight finances then Spain can be an unforgiving place to be and this can lead quickly to disillusionment. 5. Gaining employment is very difficult when you are living in Spain, unless you are completely fluent in Spanish or have a niche skill that is required in the country. If you have to rely upon earning a regular income, preferably doing something interesting – then failure to find this can prove to be extremely stressful and quickly produce insurmountable problems. 6. Few things can have a more deleterious affect than having problems with your property in Spain. If your property has endless defects (or is more costly to rectify then you imagined) then this can place a horrendous, negative ‘drip-drip’ affect upon your daily life. Ensure that your chosen property in Spain is well communicated – so that it is easy, cheap and convenient to travel back to your home country to see friends and relations or for them to come and see you. Also, always ensure that the place to where you relocate has the potential for a good, accessible social life. This normally means being within close proximity to a reasonable number of like-minded natives from your own country. Make your move completely consensual – and do not relocate unless it is. You must both agree beforehand to share equally the responsibility for the move. This way you will fight together through any and all problems – without unfair recriminations. Keep your expectations about relocating realistic. Realise that relocating to Spain will bring joy as well as problems and that although you are moving to a country that will provide a better quality of life – it cannot give you perfection! Make sure that you are financially secure and avoid taking on debt. Allow, conservatively, for currency variations (particularly if your native currency is not the Euro) and appreciate that Spain is no longer anything like as cheap as it was in the past. Indeed, the cost of living is rising all the time and you should make allowances within your finances for this – and any unexpected financial demands. If you need to work then make sure that you bring to Spain a niche skill and recognise that unless you are completely fluent that you will have little likelihood of finding work easily within the Spanish marketplace. Remember that the Spanish are generally highly qualified and already possess all the skills that exist in Northern Europe. Buy a property in Spain by exercising greatly more care and caution than you would in Northern Europe – and always compromise to buy a property in Spain that is fully legal, fully urbanised and needs the absolute minimum of renovation work. So, always use a first class, independent, specialist conveyancing lawyer who speaks your language fluently and have a professional survey performed on the property you want, before you buy it. Moving to a foreign country is not for everyone. I have lived in Spain off and on for 50 years and have found it challenging and rewarding;the same as if I stayed in my home country. Nowhere is there the perfect life. It is what you make out of it. I hope the 30% read this. Absolute common sense to those of us that have been here 10+ years. I have seen ever single one of these…more than once. Be careful people! Do you have any tips on finding accommodation in Spain whilst still living in the UK? I have had a job offer but I do not want to come over homeless.